I turn to Izy Hossack’s blog, Top with Cinnamon, for delicious and vegan friendly recipes. But more often than that, I read it for culinary guidance. Izy has a knack for making seemingly complex recipes (especially baking projects) feel easy and appealing, and her curious, studious spirit shines through her words. She’s obviously fascinated by food, but not in a way so academic or scientific that she doesn’t also seem to have a lot of fun when she’s cooking, too. 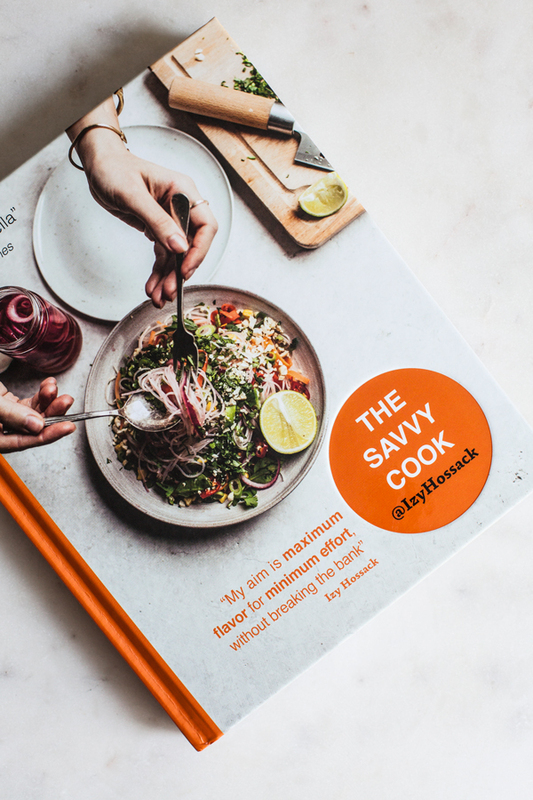 Her new book, The Savvy Cook, is made up of 100 recipes that embody the best of what Izy shares on her blog: food that’s simple, but not at the expense of taste or technique, and budget-friendly to boot. It’s full of small and big meals that you can whip up using pantry-friendly ingredients, and at a moment’s notice. These are dinners and lunches and snacks for busy days and nights, relayed in a voice that encourages modification and flexibility. It’s an awesome resource for plant-based cooks who are either new to the kitchen or hoping to simplify and streamline their cooking. The book includes recipes like Lazy Potato Hash, Orzo with Squash, Chili, Lemon & Peas, Paprika Bean Stew: nutritious, grain and legume-based dishes that come together quickly. It’s also full of staples, like homemade flatbread and pita, tons of dips and dressings, pizza dough, and pickled vegetables. My favorite feature is Izy’s “clear the fridge” section, which features recipes that can be prepared with odds, ends, and scraps—such useful guidance, and often overlooked in cookbooks. The section is organized around templates, including a pizza template (with three different flavor/ingredient options), a frittata template (not vegan, but I’d love to try with silken tofu), a taco template, and a stir fry template. And needless to say, Izy’s “cheeky treats” section is full of desserts that are beautiful to look at, but non-fussy. I’m dying to try her oaty snack cake, cookie dough balls, and apricot sugar buns. Izy’s falafel smash brings together everything I love about the book. It’s incredibly quick to make, and it comes together with zero appliances, but it still channels the flavor and ingredients of homemade falafel. 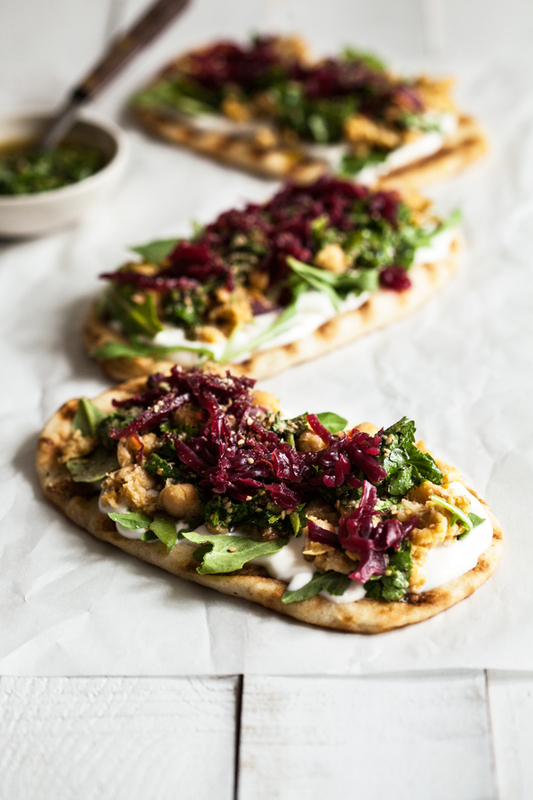 Basically, you spread two flatbreads or pitas with yogurt (regular or vegan), then pile them high with spicy greens, pickled vegetables, a quick cilantro sauce, and a chunky mixture of smashed chickpeas with cumin and olive oil. It’s textured and flavorful, and each part of the recipe takes only a couple minutes to make. 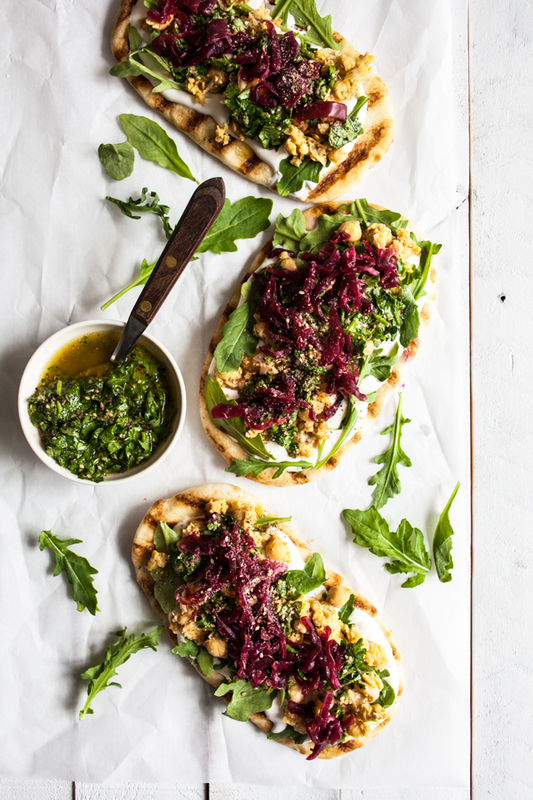 Izy offers the option of homemade pita or flatbread, but that’s optional. 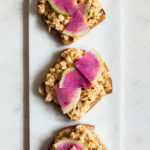 Another bonus of this recipe is that you’re likely to have many or all of the ingredients at home (a can of chickpeas, a bunch of cilantro or other fresh herbs, bread, spices, olive oil). I didn’t actually have any red onion with which to make the suggested pickled onion, but I did have some homemade pickled red cabbage, and I suspected Izy would say that was just fine, given how welcoming she is to tweaks and adjustments. The cabbage was delicious, as was the whole recipe: it was a lunch that felt flavorful and thoughtful in spite of being easy enough to whip up in less than twenty minutes. I’m sure I’ll be making it again, adding different herbs and pickled things as I go. In a bowl, lightly mash the chickpeas with the back of a fork, or pulse them briefly in a food processor or countertop blender if you have one. Stir in the salt, ground cumin, ground coriander, crushed red pepper, lemon juice, and olive oil. In a small bowl, stir together all the ingredients for the cilantro sauce. 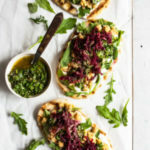 Layer up the yogurt, the pea shoots or arugula, chickpea mixture, cilantro sauce, and pickled or raw red onion on the breads and serve. The Savvy Cook is such a rich resource. Each recipe feels not only like a recipe, but also like a meal idea that can be spun out in many new directions. At the end of the book, Izy offers up tips on how to meal plan for busy weeks, some sample days (featuring the recipes), and even a sample shopping list. She clearly believes—as I do—that home cooking can have a place in any busy schedule. I’d love to offer one of my US or Canadian readers a copy of this super savvy, super inspiring book. If you’re interested in checking out the recipes for yourself, please enter below! I’ll announce the winner one week from today. And on that note, the weekend’s here, and we made it. See you for another Sunday roundup. This looks incredible, Gena! Thanks for sharing another great nourishing, busy-person-friendly recipe. Hi, this looks like a great addition to my cookbook collection! Favorite fridge clean out meal is veggie primavera. YUM! I like to make a pizza and through all sorts of random fresh toppings on top, I always hate the waste when you don’t use very much of something! So pretty and it sounds like a fabulous book! I usually end up roasting whatever veggies I have with chickpeas and make something like rice to round it out to clean out the fridge. Just lazy but good! Fridge-clearing soups and stews. It revives the flavour in vegetables in danger of going off. This looks amazing! 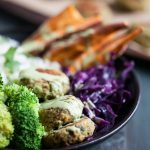 I’ve always loved the idea of a deconstructed falafel and this recipe fits the bill perfectly. I love roasting my chickpeas and may try this technique with roasted chickpeas mixed with your combo of spices. Yum, my mouth is salivating at the thought. I like to make vegetable stock with the odds and ends of veggies in my fridge! One of my favorite “clear out the fridge meals” is tacos. I almost always have some leftover sauce, hummus, or pesto on hand – a quick swipe of that on a tortilla, plus a handful of veg and beans/lentils for proteins makes a perfect meal. This so much the food I love to make! Frittatas help me clean out the fridge–everything goes–including rice! Soup is usually the easiest way! Sunday nights I usually clear out the fridge and put everything in a veggie soup. Not sure if my fridge clean out meal really has a name–I mostly just throw together whatever veggies are in there with whatever condiments are in there and serve it with a grain. Looks tasty! Her book is on my wish list. My favourite clear the fridge meal is to throw bits and pieces into a pot, add whatever leftover grains and cook into congee. 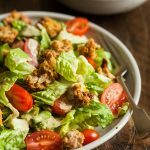 I like to make a leftovers salad – pretty much anything tastes good on a bed of greens! Those seem so simple but so delicious! This cookbook looks great! My fave clear the fridge meal is probably a salad. I’m always trying to “use up” all those veggies! I’ve become really bad at meal planning, but I still cook 99% of my meals at home. Each meal feels like a cleaning out the fridge meal because I’m pulling together odds and ends, mindful to use things before they spoil. Frittatas and vegetable sautes that I put on salad greens with pickles are my go-tos. Holy Falafel, this is such a good idea and looks nothing short of delicious -in other words, chef Izy strikes again! That said, I definitely lack your guys’ skills (all the more reason for me to be crossing my fingers super hard),which means that my go-to “clear out the fridge” meal really is nothing more than a throw-together of raw veggies & greens, with whatever pre-cooked grain I have on hand, as well as either mung beans, edamame, lentils, peas or roasted spiced chickpeas (occasionally, I’ll also drizzle on some lemon juice and top it off with some fresh parsley). my favorite way to clean out the fridge is throw the veggies on cookie sheet and put them in the oven to roast. My favourite clear out the fridge meal would be a toss up between a loaded salad or taco meal. Fried rice is my favorite clean out the fridge meal. This book sounds great! I definitely need clear out the fridge ideas to use up some of my CSA vegetables! I like to make clean-out-the-fridge quiche (non-vegan, I know – I’m only vegetarian at this point). It’s a good way to deal with greens that are a little past their prime, bits of leftover roasted vegetables, ends of cheeses, and leftover rice (which I sometimes use instead of a pie crust). A chipotle style burrito bowl with rice (or some sort of grain) and beans and whatever sauteed veggies I need to get rid of. Then you can flavor the veggies however you want…mexican spices, jerk seasonings, italian. So versatile. I make veggie broth to clean out the fridge! My favorite clean out the fridge meal is to make pesto from whatever green thing needs to be used up, mix it with cooked grains and top with grilled (summer) or roasted (winter) veg. Yum! Yummy! This looks really tasty! I like making a frittata with vegetables form the farmers market that need to be used up. 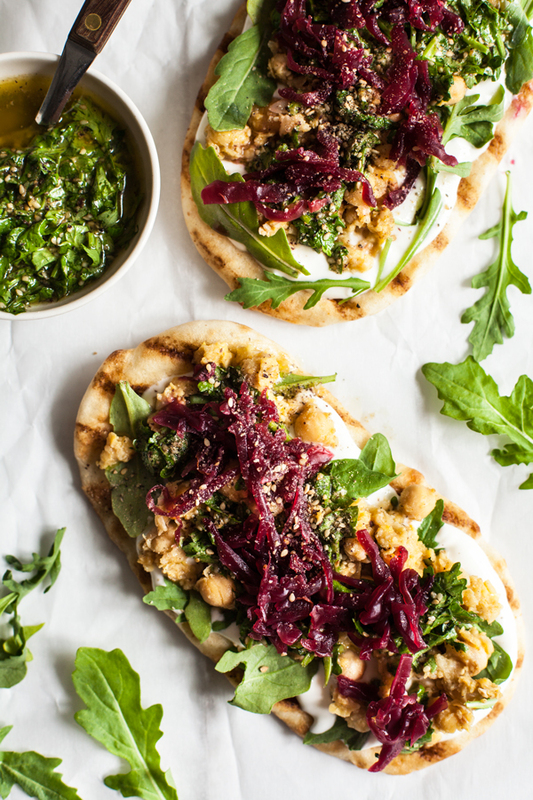 This looks great – I love falafel! My favorite clean out the fridge meal is usually some kind of a veggie stir fry where I just throw in all the fridge veggies, make some rice, a sauce and maybe tofu. Wow, that looks great! And what a gorgeous photo! I’ll have to take a look through Top With Cinnamon–thanks!